Sand dunes are small ridges or hills of sand found at the top of a beach, above the usual maximum reach of the waves. They form from wind-blown sand that is initially deposited against an obstruction such as a bush, driftwood or rock. As more sand particles are deposited the dunes grow in size, forming rows at right angles to the prevailing wind direction. If vegetation, such as Marram Grass and Sand Couch, begins to grow on the dune its roots will help to bind the sand together and stabilise the dunes. Sand dunes can be important ecosystems supporting unique plant life and a healthy population of small animals and insects. 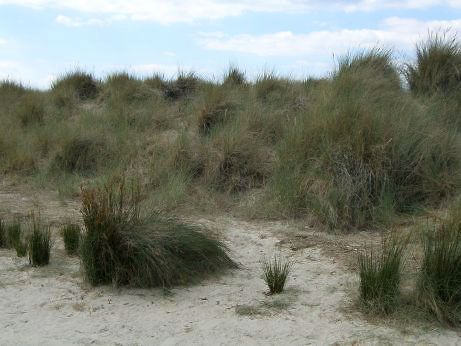 An example of a sand dune ecosystem is found at West Wittering, part of the Chichester Harbour Conservancy SSSI, on the South East coast of the UK. 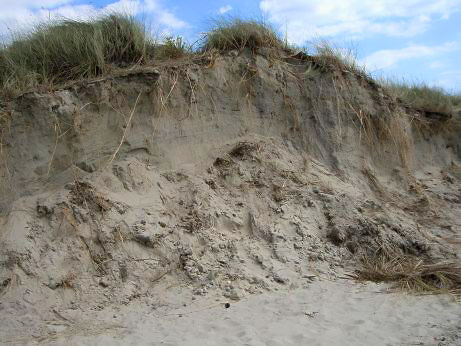 Dunes are vulnerable to erosion by natural processes and by human activity. 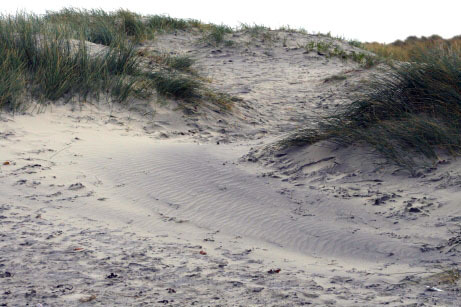 It is common to see sections of dunes fenced off to prevent public access, or for paths to be laid to prevent people from eroding the dunes. Sand dunes occur at the top of beaches, above the high tide mark, but not every beach has dunes. For dunes to form there must be a supply of sand, a means of transporting it, and somewhere for it to be deposited more quickly than it is eroded. At low tide, deposits of sand in the inter-tidal zone (between the high and low tide marks) may be exposed and start to dry. The dry grains of sand can then be transported by the wind (by saltation). If the wind blows towards the land, sand will be transported up the beach and beyond the high tide mark. In this photograph the light coloured mist is actually sand being blown up the beach by the wind. When the dried sand reaches the top of the beach it can be trapped by debris such as driftwoodand dead seaweed, or rocks and pebbles as in this photograph. If the sand is not eroded again it may become colonised by small plants, or trap other windblown debris, increasing its size and thus trapping even more sand. In this picture the wind is blowing from the right to the left. To the right of the pebble are darker and slightly heavier sand grains and to the left of it are lighter sand particles. 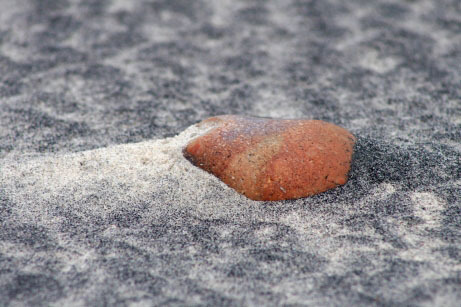 The lighter sand grains are deposited where the force of the wind is broken by the pebble acting as a wind break. With the right conditions this pebble could become the start of a huge sand dune. As the dunes grow in size they are able to catch more of the sand blown across them by the wind. In this photograph the wind is blowing sand from the right to the left, but the middle part of the picture is sheltered by grass growing behind and to the right of the image. This causes the wind speed to lessen and the sand grains are deposited. The smooth area of lighter sand in the centre of the picture is the sand deposited during the day on which the photograph was taken. It was 7cm deep in the centre. 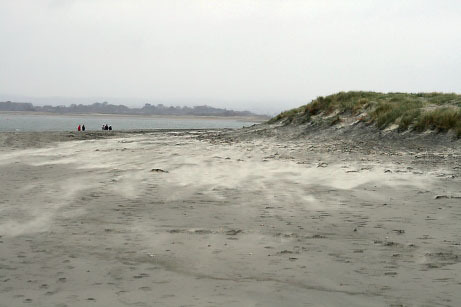 In this picture you can see a well establshed sand dune lying about 100m above the top of the present beach. The dune forms part of several parallel rows of dunes that trap sand blown off the beach. The thick covering of vegetation preserves the dune in two ways. Firstly the roots bind the sand together, and secondly the above ground vegetation traps particles of sand as they are blown over the surface. Dunes are not permanent features and can be eroded when conditions change. This old dune is being eroded by the sea at high tide because the beach profile has changed and waves now reach further inland. The pebbles and flat sand at the base of the dune show where the last tide stopped. 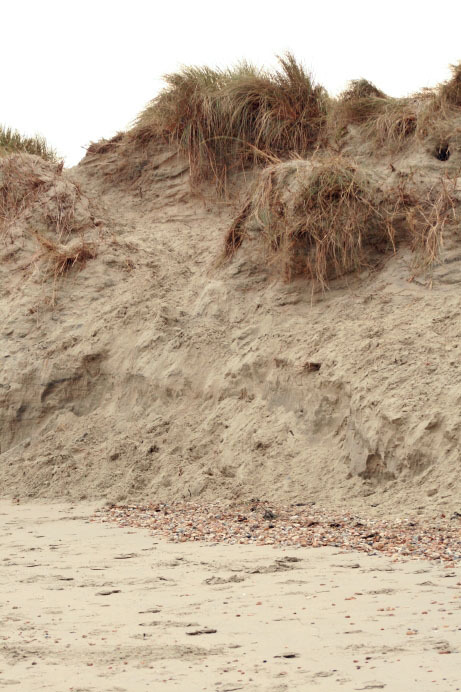 The collapsed sand beyond them is a result of waves undercutting the base of the dune, weakening it and it being unable to support the weight of the sand above it. At the base of a dune there are no plants or roots to bind the sand grains together so the sand is easily eroded by the wind and water , or by humans and animals crossing over it. Ten years ago this dune was in the middle of a wide belt of similar dunes over 100m from the high tide mark, but due to rapid erosion there are now very few dunes left at this location.